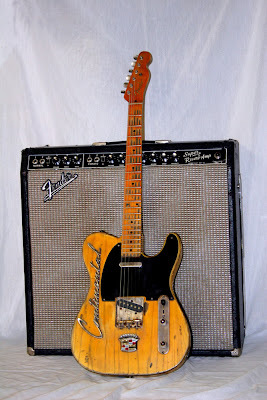 KLH Custom Relics, Nasty Mojo!! A recent anonymous tipster comment referred me to KLH Custom Relics, the mad relic laboratory of Indianapolis guitarist/luthier Kevin L. Heffernan. Yes, he does Strats too, but this Tele, dubbed "The Continental" just reeks of nasty goodness thru & thru. Just click the image for a better pic-- (which also contains a closeup magnifier). The Continental features an old Lincoln Continental chrome name strip and a 40's era Cadillac emblem plate behind the bridge. Another gallery piece is a black Tele named "Dynaflow", which bears a similar chrome name strip from the 40's Buick Dynaflow transmission equipped automobiles. 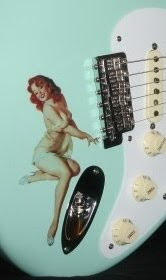 KLH's Strat stuff is cool too, but the Tele treatments seem to get the most creative touches. He's even relic'd some Thinline reissues. So go check 'em out!